How can I use Netflix on Ubuntu? Is there a way to stream Netflix content to my Ubuntu machine? 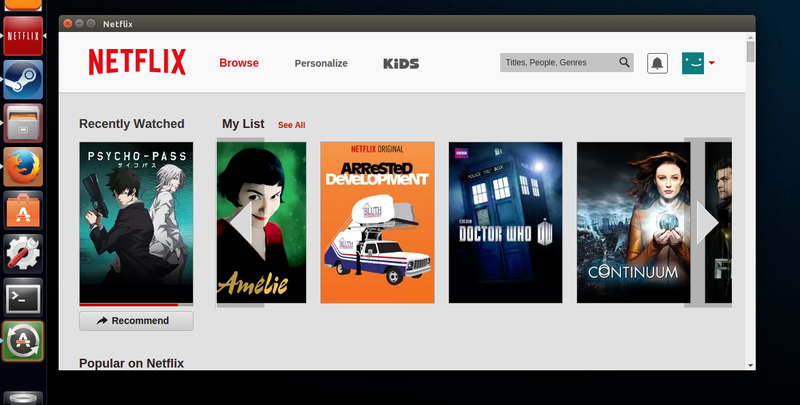 Please note that Ubuntu releases 12.04, 14.04 and newer now support native Netflix playback via HTML5. The solution in this answer should only be used in cases where native playback is not possible (e.g. 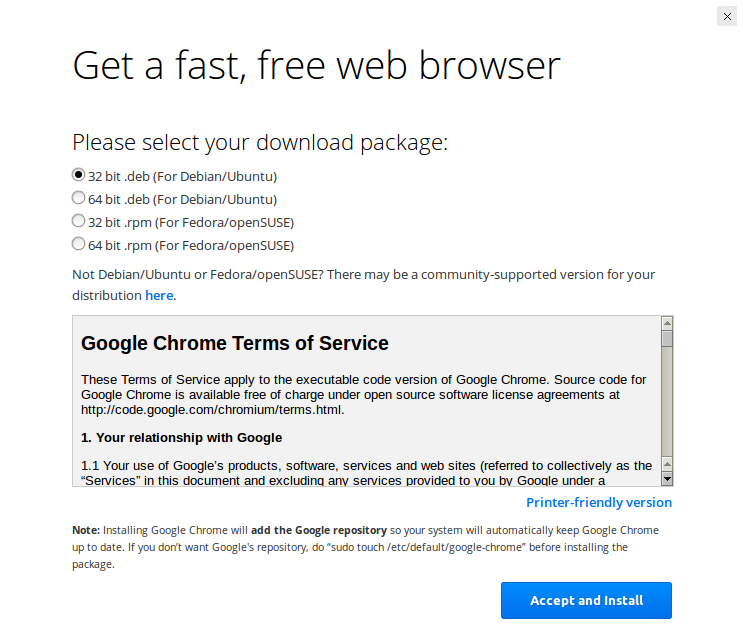 unsupported Ubuntu releases, browsers other than Google Chrome). Also note that as of Firefox 49, Netflix playback is natively supported. As of December 7th, 2012 the following works on 12.04 and 12.10 (at least). Note: For new instructions --as of October 2013-- on how to install (Windows-)silverlight (ultimately useful to watch Netflix) in Firefox see at the end. Are PPAs safe to add to my system and what are some "red flags" to watch out for? This will install around 254MB of packages, mainly it will install wine-compholio (a custom version of wine that is able to run Silverlight) and dependencies. If wine is not installed already you may need to agree to use Microsoft fonts (in the text mode window use arrow keys or tab to reach the red "ok" button in text mode when it appears). The download/installation takes around 15 minutes. 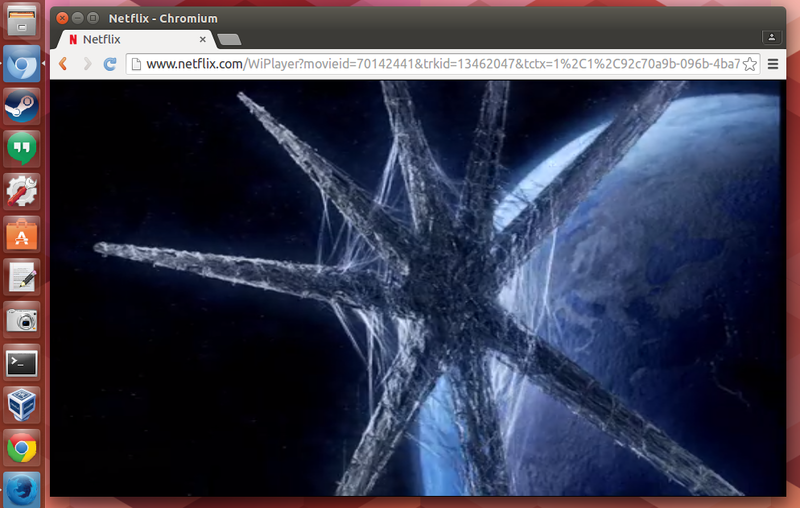 Then run the newly installed "netflix-desktop" application from the menu (or from the command line). If something went wrong in the installation (third party links are involved), don't panic: netflix-desktop will detect that something is missing and try to reinstall it, if that also fails, start over. When you run it for the first time it will initialize wine and probably ask about installing Mono and Gecko wine packages (I accepted and installed them just in case). The netflix-desktop application opens up, login to your Netflix account. Use Netflix as you would normally do. It worked flawlessly in my Ubuntu 12.04 and 12.10 (I have a Core i7). Bonus: By running this you have a fully functional Firefox 17 (Windows version) with working Silverlight that can be used to navigate other sites, by pressing F10 -> View -> Toolbars -> Navigation menu on the main window you can access any site and be able to use Silverlight. Then install the UAControl Firefox add-on (UAControl - neko.tsugumi.org) and convince movies.netflix.com that your browser is a Windows one, for example "Mozilla/5.0 (Windows NT 6.1; rv:23.0) Gecko/20131011 Firefox/23.0". Head over to Netflix and try out a movie or show. Everything should be working fine now. 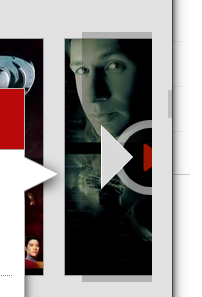 Make sure to replace /home/USERNAME/Pictures/netflix.png with the correct path to your Netflix icon. Save the desktop file and exit your editor. recommended: install a user-agent switcher add-on. i use http://mybrowseraddon.com/useragent-switcher.html, but almost all user-agent add-ons should work. you can also edit directly the firefox user-agent, but not recommended, as this will send the chrome user-agent to all sites and that might break other things. 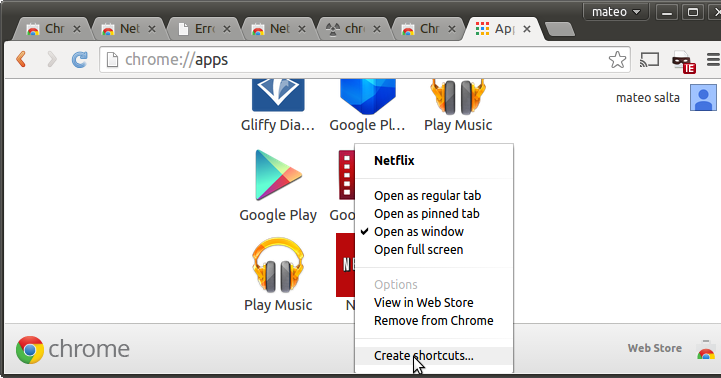 That add-on can be configured to send only chrome user-agent to netflix site. PlayOn — the service which drives Netflix (and Hulu) — will be rolling out an HTML5 client which should negate the need for Silverlight (and Moonlight). It’s out for the iPhone now, and I assume that it will shortly be used to stream PlayOn services to Linux Machines. I read a while ago that it might be possible to run a Wii emulator instead of virtual box, but I don't think that would be an improvement for most people. I've been meaning to try Netflix in an android emulator since the app came out, however I still need to test if it will actually work. The problem is that the app is only "approved" for certain phones. There is a hack that is suppose to work for rooted phones, So I think there's a good chance this could be a better solution than virtual box, but it's hard to say for sure. If someone else gets this working please let me know. Moonlight, while it is an open-source alternative to Silverlight, does not work for Netflix. The reason that this does not work for Netflix is that Netflix also requires DRM support, which Moonlight does not give. 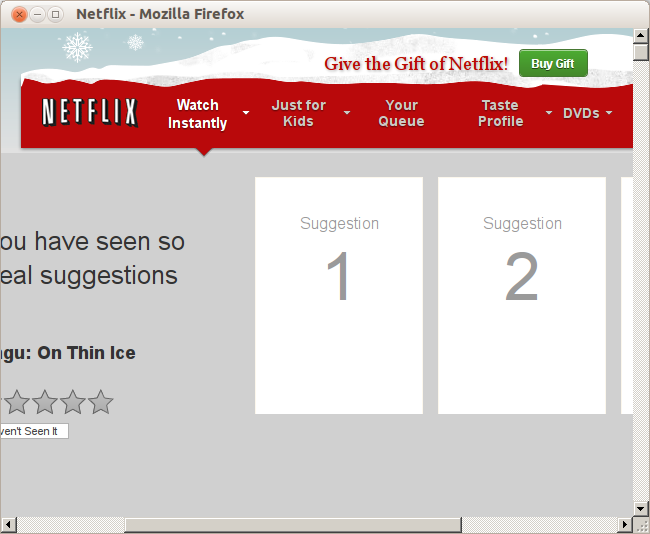 There IS a way to watch things on Netflix through Ubuntu though. You will want to virtualize Windows XP/Vista/7 on Ubuntu. I would recommend Virtualbox, but you are free to use whatever you want. Under the virtual machine, you can use the real Silverlight and DRM-support and watch Netflix. 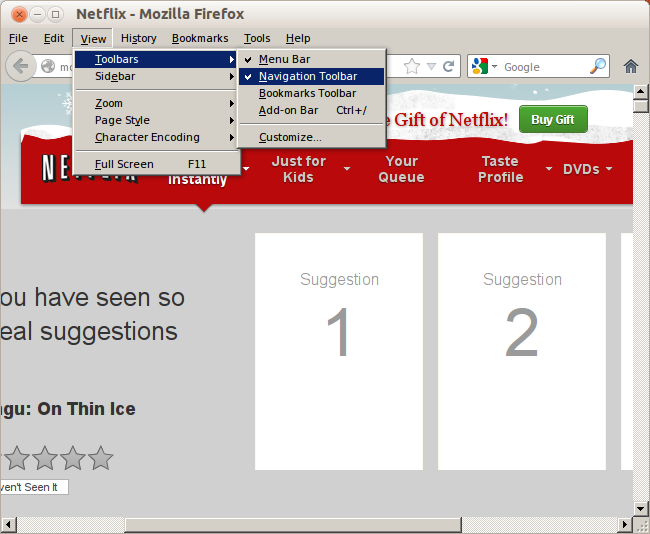 Pipelight is a plugin that builds upon Erich Hoover's Netflix-Desktop to allow Ubuntu users to watch Netflix from within a native Firefox browser. Now Silverlight will work on some sites but Netflix and some others check the browser user agent and will not play on a Linux machine. In Firefox got to Tools -> Add Ons and search for User Agent. Select the latest Firefox/Windows combination. Head over to netflix.com and enjoy. Netflix desktop is too resource intensive and the overlay is VERY ANNOYING, I would HIGHLY recommend the following steps and use Firefox. Now you won't have a dedicated application for Netflix and you can use your existing browser installation. Then find netflix in the launcher and it should work. It has some further troubleshooting notes that I didn't post here so check it out if this doesn't work for you. Not the answer you're looking for? Browse other questions tagged netflix or ask your own question. How to watch Netflix in Ubuntu? How can I watch Netflix on 16.04 with either Chromium or FireFox? Is it Possible to View Netflix Instant Movies on Ubuntu? 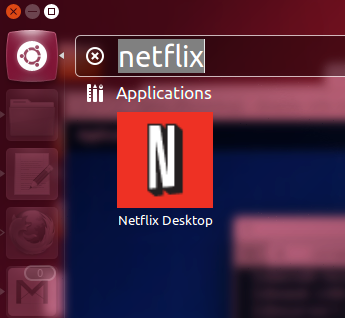 Can I stream Netflix to Ubuntu via a Mac? How do I watch netflix on Ubuntu 12.10? How can I watch Netflix on 32-bit Ubuntu systems?